Guys guys guys guys guys guys guys! As you may have noticed, I have been posting less and less on this blog. 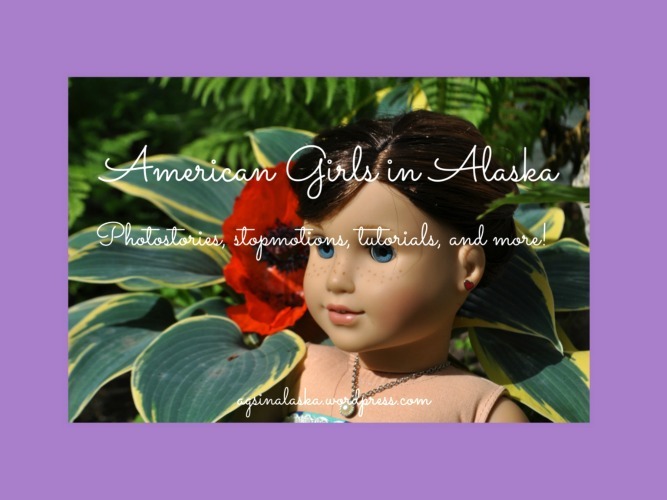 That does not, and I repeat, DOES NOT mean I am going to stop blogging on American Girls in Alaska. I actually started a new blog! I introduce to you . . .
Click here to go check it out. I will still be posting on both of my blogs, guys. But as I’ve gotten older, I’ve realized that I feel quite limited in what I can post about on my doll blog. I’m sure many of you feel the same. I don’t want to be limited by only being able to post about dolls, so on my personal blog, I’ll be posting about photography, traveling, reading, writing, Alaskan life, my pets, and maybe even cooking! Plus, since I’m leaving for Europe in 37 LONGGGGGGGGG DAYS, I decided I needed to have a place to post about my adventures! One last thing – I’VE DECIDED TO GO BY AN ALIAS. You may no longer call me AGsinAlaska. Sorry, that sounded super demanding. Please don’t call me AGsinAlaska. My new name is Morgan McCartie. Why Morgan McCartie, you may wonder? Well, due to some strange family history, my last name was, about five bazillion years ago, changed from McCartie to my current last name. And Morgan is a name my parents considered for me before I was born. Since the two go together quite well . . . Anyway, I look forward to seeing you over on my new blog! 4 Years . . . What? I just got a notification saying I’ve been blogging with WordPress for four years. Hey friends! I MISSED YOU GUYS SO MUCH!!! Life has gotten a little crazy around here, what with skiing and now track and field, and school on top of all of that. But did you guys really think I would just abandon you like that? I was recently looking back through some of my old blog posts and realized that I miss blogging. A lot. So I’m going to make more of an effort to allow time for writing posts. I have no plan to quit blogging anytime soon, and once summer comes, I will have a lot more time to take pictures and write stories. Here’s to more awesome blogging, friends! Hi everybody. I’m not sure if you heard, but at 8:28 AM this morning, there was a MASSIVE 7.0 magnitude earthquake in the city of Anchorage, Alaska. The earthquake was felt in cities all over Alaska, not just Anchorage. I was in school at the time, about to begin my ASL class when suddenly, the classroom started shaking back and forth. We all dove under our tables and watched as chunks of the ceiling began crashing to the ground. The power went out for about ten seconds, until the emergency power kicked in and the fire alarms went off due to dust. No one was injured, but it was terrifying. The whole earthquake lasted for only about a minute, but there are still aftershocks being felt now (over six hours later). One aftershock was even registered as its own, smaller earthquake. Schools in Anchorage, (the city where the biggest damage was felt), are closed until Wednesday. The power is out in many places. The international airport was evacuated. There was a fire in Anchorage. Traffic is so clogged up, there are people who have not even reached their homes yet. Roads are split, and several overpasses collapsed. We are still in a state of emergency. Please be praying for the safety of Alaskans and we recover and rebuild from the damage, and pray for those who are not yet safe in their homes. God bless you, and have a great weekend. Hey guys. I’ve been hearing some things about why I haven’t been blogging lately from some friends of mine, and yes. I know I have not been blogging lately. Here’s why. I know this sounds like an excuse, and yes, I probably should’ve announced a hiatus. But I’m going to do my absolute best to blog more now. I’M NOT LEAVING, GUYS. DON’T WORRY. BUT I am taking three classes at a public school this year, so with that, homework, and other classes, I think I may only be able to post only ONCE a week, or twice if possible. I’m getting started right now – check out my new A Day In The Life post, featuring Grace! Great job, guys! The new additions are . . . . . .
Everybody, please welcome to the family . . .
We acquired our new furry friends on June 11th, so it’s been a month. The puppies are five months old and are from the same litter. First up, we have Callie. That’s it for now . . . oh yeah. Quick announcement. My posting schedule is going to be sort of wonky this summer, with the extra free time I’ll have and then crazy busy weeks, so expect two posts a week – but they may not necessarily be on a Monday and a Thursday. I’ll see y’all later this week!